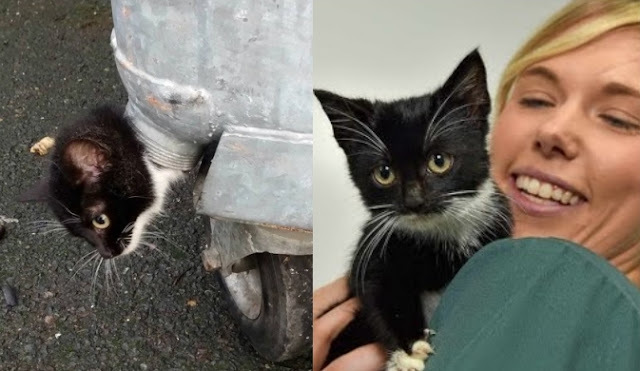 After getting her head stuck in the bottom of a garbage bin, a tiny kitten in England was given a second shot at life this week thanks to a team of rescuers who refused to give up when the going got strange. On Tuesday, Steve Morrall, an investigator with Royal Society For The Protection of Animals (RSPCA), responded to reports of a trapped cat and came across a surprising scene: A 5-month-old stray kitten with the body of a trash can. "When I arrived, I saw the head of the kitten poking out from this bin," said Morrall. "It was so unusual and I have never seen anything like it before." Morrall says he thinks the kitten was looking for food in the trash and "panicked when the bin was being emptied," getting her head stuck in a small drainage hole. Recognizing he couldn't free the kitten alone, Morrall called firefighters for assistance. Together, they were able to push the tiny cat's head back inside the trash can using some quick thinking, a funnel and a generous helping of lubricant. Amazingly, the young cat escaped her close call with the dustbin without any injuries. Soon, the lucky kitten will be up for adoption, but for now she has a new lease on life and an appropriate new name: Dusty. Responses to "Cat Stumps Rescuers By Getting Stuck In The Weirdest Place "